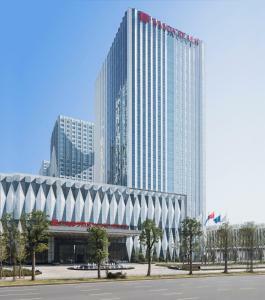 Towering over Ninghai with views of Roushi Park, Jinhai New Century Grand Hotel Ninghai offers elegant 5-star accommodation. Featuring first-rate leisure amenities, it provides free internet access and parking. Featuring classic Chinese or abstract prints on walls, pleasant rooms offer the comfort of spacious layouts and an armchair with ottoman. Each room comes with a flat-screen TV and a safe. For leisure, get a good workout at the well-equipped fitness centre. Alternatively, enjoy soothing spa treatments or relax in the sauna. 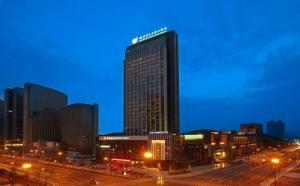 Staff at Jinhai New Century Grand Hotel Ninghai can provide tour and car hire services. 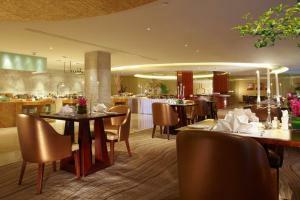 Dining options at Jinhai New Century Grand Hotel serve a variety of Chinese specialities and Western dishes. The lobby bar provides a cosy environment for after-meal drinks. 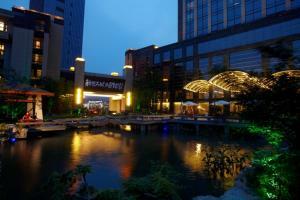 Jinhai New Century Grand Hotel Ninghai is a 5-minute walk from Roushi Park. 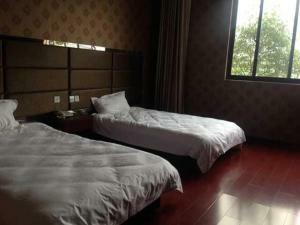 It is 2 km from Ninghai Bus Station and 3.5 km from Ninghai Railway Station. 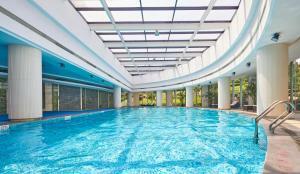 Located on Mountain Hua’an, Yuyao Yangming Hot Spring Resort features a spa, a fitness centre and an indoor pool. Modern rooms come with free WiFi. Free parking is provided. 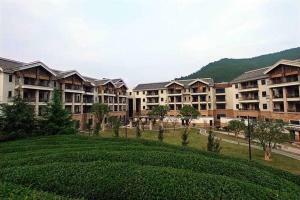 Yuyao Yangming Hot Spring Resort is 8.1 miles from Yuyao Railway Station. Kaolaoshan Scenic Area is a 1-hour drive from Yuyao Yangming Hot Spring Resort. It takes around 25 minutes driving to Yuyao Museum. Featuring warm tones, each room comes with a TV, an electric kettle, a minibar and a refrigerator. You will find a shower and a bath in the attached bathroom. For your convenience, slippers, free toiletries and a hairdryer are provided. Guests can enjoy use of the games room or sauna for recreation. A business centre and tour desk are available for convenience. Laundry and dry cleaning services are offered. Shanhaijing Restaurant provides a selection of Chinese food. There is also a café for light meals. Set on the South Bank of Shuangxi River, the modern Jinhua Narada Hotel features a gourmet restaurant with panoramic city views. 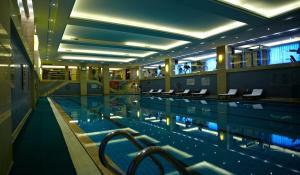 A fitness centre, a hot tub and karaoke facilities are provided at the hotel. Located in Jinhua’s business and entertainment area, Jinhua Narada is an 8-minute drive from Jinhua West Railway Station. It takes 5 minutes by car from the hotel to People’s Square in the city centre. 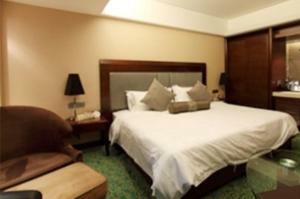 Bathed in warm light, the 4-star rooms are beautifully decorated and fitted with fine beddings and furnishings. Each offers free internet, a minibar and a flat-screen TV. 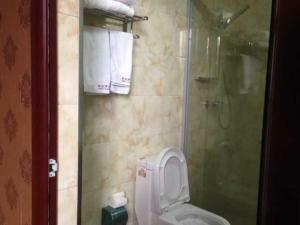 Bathrobes, free toiletries and slippers are included in the bathroom. Narada Hotel provides free bicycle rentals for guests who wish to explore the area. Car rentals, day trips and ticketing can be arranged at the tour desk. Guests can also play table tennis on site. 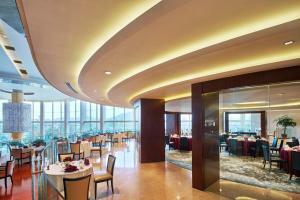 Chong Tian Lou offers spectacular city views with its Chinese delicacies. 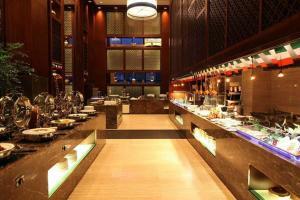 Yu Lin Western Restaurant serves daily buffet spreads, while Rong Rong Ju has delicious Chinese food on its menu. 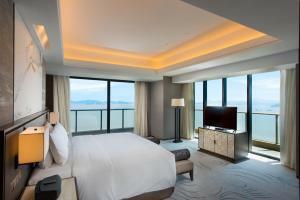 Set nearby the ocean, Hilton Zhoushan offers accommodation that oversees Putuo Mountain. Free WiFi is provided throughout the entire property. The hotel also offers free shuttle service. Donggang is a 5-minute drive from Hilton Zhoushan. Zhujiajian Scenic Area is a 11-minute drive away. Ningbo Lishe International Airport is a 12-minute car journey away. Spacious and luxurious, all of the guest rooms here feature a flat-screen TV with satellite channels, a well-stocked minibar and a personal safe. Guests can relax and enjoy the lake or sea view from the room. Each private bathroom comes with a hot tub, a hairdryer, slippers and free toiletries. Guests can engage in various activities such as playing tennis, maintaining work out at the fitness centre and relaxing and having fun in the games room or library. 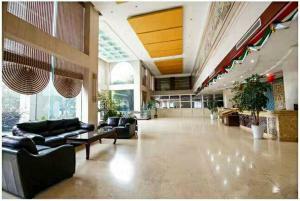 A business centre with well-equipped meeting facilities is available for business needs. Car hire and airport shuttle service is accessible as well. Guests can pamper themselves with relaxing spa treatment at the spa and wellness centre. A buffet style breakfast is served at the hotel. 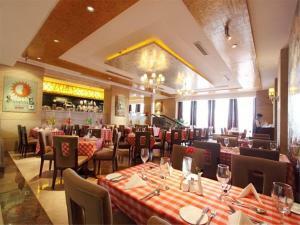 3 on-site restaurants offers a wide range of authentic international dishes. Guests can enjoy relaxing and refreshing drinks at the bar as well. Located at Taizhou Economic Development Zone, New Century Hotel Taizhou features rooms with free internet access and flat-screen cable TV. 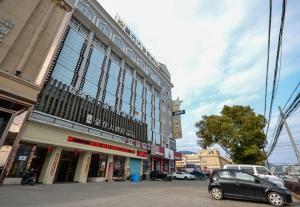 The hotel offers a sauna and 5 dining options. 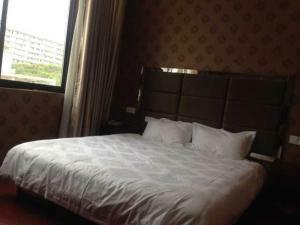 Each air-conditioned room at Hotel New Century Taizhou features a tea/coffee maker and minibar. Private bathrooms with toiletries are offered. Safety deposit boxes are available for guests’ convenience. Guests can work out at the fitness centre or go for a relaxing foot reflexology session. 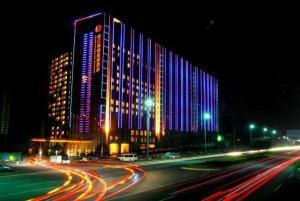 Taizhou’s Hotel New Century offers karaoke, a table tennis room and beauty salon. Free parking is available. 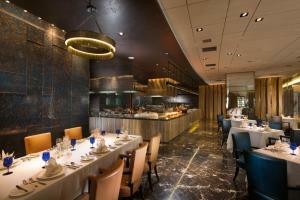 A variety of authentic local cuisine is served at Tian He Restaurant and Yuelai Private Dining Rooms. Parisian Restaurant and Rome Holiday Cafe serves Western dishes. 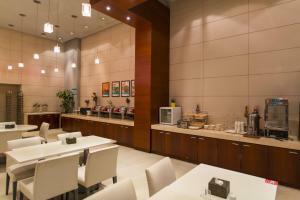 Drinks and snacks are offered at Knight and Lobby Bars. 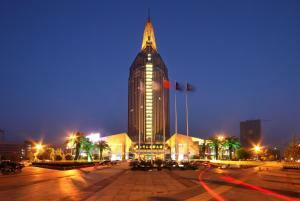 Taizhou Railway Station is a 40-minute drive away while Huangyan Airport is 6.2 miles away. Tonglu Joy Random Inn offers free WiFi and rooms with air conditioning in Tonglu. All rooms boast a TV with cable channels and a private bathroom. The property provides a 24-hour front desk. At the hotel, the rooms come with a desk. Tonglu Joy Random Inn features some rooms with city views, and each room is equipped with a kettle. All rooms feature a wardrobe. 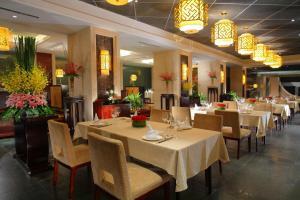 At the accommodation you will find a restaurant serving Chinese cuisine. 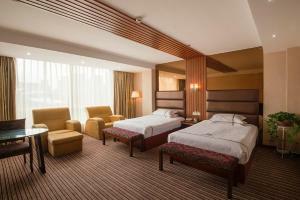 The nearest airport is Yiwu Airport, 37.3 miles from Tonglu Joy Random Inn. 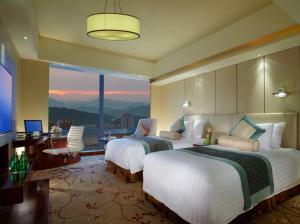 The luxurious Sheraton Zhoushan Hotel features upscale accommodation with free Wi-Fi. It offers indoor swimming pool and outdoor swimming pool, business facilities, convenient guest services and 3 on-site restaurants. Additionally, free Wi-Fi is available in all areas. 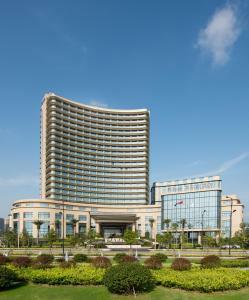 Sheraton Hotel is a 30-minute drive from Putuo Mountain and a 40-minute drive from Zhujiajian Island. Zhoushan Putuoshan Airport is 30 minutes' drive away as well. Offering different views from the private balcony, all units come with a hot tub, flat-screen cable TV, dining area, minibar, ironing facilities and en suite bathroom with a bathtub. Guests can have a soothing massage at the spa centre, sing in the karaoke rooms or play a game of table tennis with new friends. After a day of tours, taking a small stroll in the garden seems relaxing. A variety of Chinese and Western food can be enjoyed at the property. 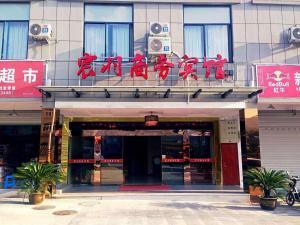 Jinjiang Inn - Jiaxing Train Station is located 100 yards from Jiaxing Railway Station. It features a restaurant and rooms with cable TV. Free Internet and free parking are available. All air-conditioned rooms at the Jinjiang Inn come with a telephone and tea/coffee maker. The en-suit bathrooms come with hot shower facilities. Slippers are also provided. The hotel offers safety deposit boxes and luggage storage at the front desk. Business facilities are available. 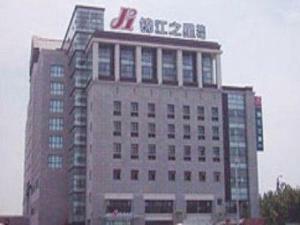 Jinjiang Inn - Jiaxing Train Station is 1.7 miles from the South Lake and 1.6 miles from Yuehelao Street. 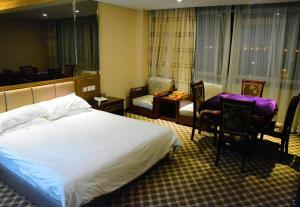 Situated in Shengzhou, City Hotel provides air-conditioned rooms with free WiFi. Boasting a 24-hour front desk, this property also provides guests with a restaurant. All rooms come with a TV with satellite channels. At the hotel, every room is fitted with a desk. 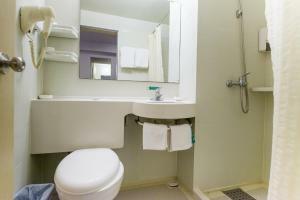 Each room comes with a private bathroom with free toiletries and a hair dryer. The rooms include a wardrobe. A buffet breakfast can be enjoyed at the property. Ningbo Lishe International Airport is 45.4 miles from the property. 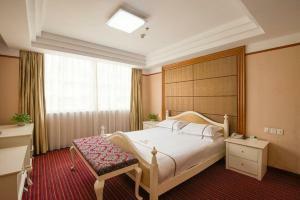 Chenyu Shangwu Hotel offers comfortable accommodation. Here, besides free in-room WiFi, the hotel offers free parking space. A flat-screen cable TV, a work desk and air conditioning are provided in each of the units. The shared or private bathroom is stocked with slippers, free toiletries and a hairdryer. 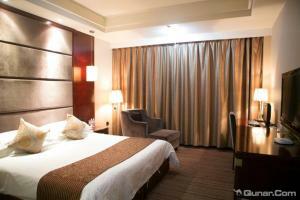 Convenient services as daily maid service and luggage storing space are provided. For dining, there are many restaurants in the surrounding area. 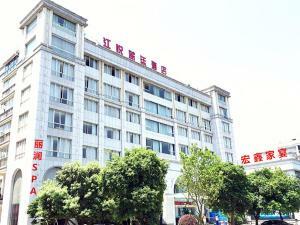 From Chenyu Shangwu Hotel, it takes 3 hours 20 minutes by car to Lishui Railway Station. 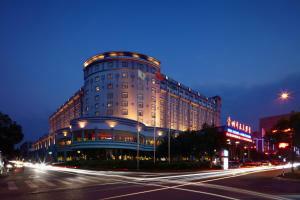 This 5-star hotel in central Tonglu features 4 elegant restaurants and luxurious rooms with a flat-screen TV. 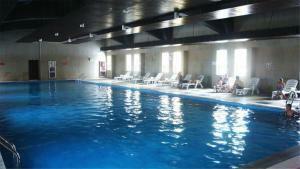 Guests can use the indoor swimming pool and modern gym for free. 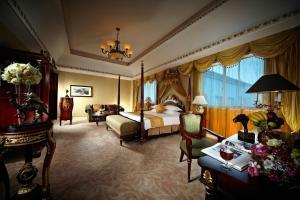 Elegant rooms at New Century Grand Hotel Tonglu provide free internet access and a flat-screen TV with cable channels. A minibar and tea and coffee-making facilities are included. Marble bathrooms come with a bathtub and shower. Guests can relax with a massage or play a game of tennis using the hotel’s courts. Free parking and a business centre are offered. The hotel also has a concierge desk. 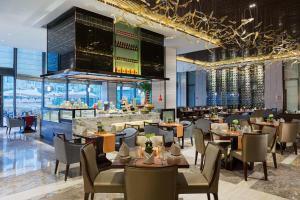 Traditional Hangzhou and Cantonese cuisines are featured at Four Seasons Chamber while Chinese and Western snacks are served at Grand Deli. Other options include Café Mediterranean and Rose Garden lounge. 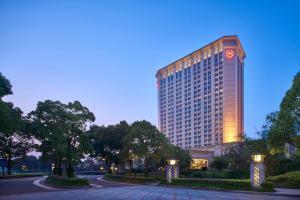 The hotel is 70 km from Hangzhou Railway Station. Hangzhou Xiaoshan International Airport is 110 km away. 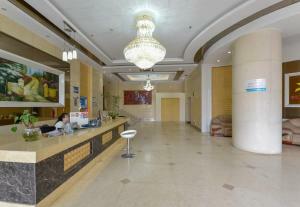 Situated in Lishui, Lishui Hao Deng Hotel is 3.1 miles from Adventure Island Waterpark. Free WiFi is included. At the hotel, every room comes with a desk and a flat-screen TV. 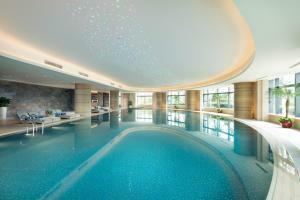 Featuring an indoor pool, Wanda Realm Jinhua offers luxurious accommodation in Jinhua, a 20-minute drive from Zhejiang Normal University. WiFi is available throughout the property. Bayong Park is a 3-minute drive from Wanda Realm Jinhua. The nearest airport is Yiwu Airport, 27.3 miles from Wanda Realm Jinhua. Baoningmen is an 11-minute walk from this property. Jinhua Railway Station is a 10-minute drive away. All rooms at this ultra-cozy hotel are air-conditioned. Each unit features a cable TV, a telephone and a desk. Each room is fitted with a private bathroom offering slippers and a hairdryer. Guests can work out at the on-site fitness centre. You will find a 24-hour front desk and laundry facilities at the property. Concierge service is also provided. Guests can enjoy the on-site restaurant. 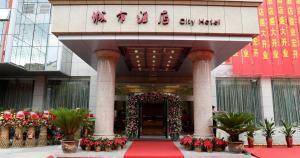 Located beside Dongyangjiang River, Hyde Jianguo Hotel Yiwu is an 8-minute drive from White Cloud Cave Scenic Area. 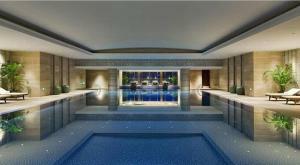 This property boasts an indoor pool, a fitness centre, business centre and 6 dining options. Free internet access is provided. 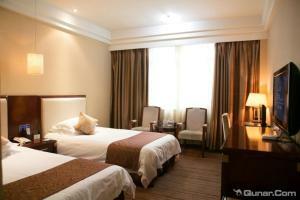 Hyde Jianguo Hotel Yiwu is 5.5 miles from Dongyang downtown area, 13.7 miles from Yiwu Airport. Yiwu Railway Station is 14.3 miles away. Combining classic elegance with contemporary touches, the guestrooms feature warm lighting and carpeted floors. Each unit is fitted with a flat-screen cable TV, wardrobe and an electric kettle. The attached bathroom has showers and free toiletries. For an indulgent experience, guests can relax in the sauna, enjoy soothing massage treatment, or play a game of billiards or table tennis. Alternatively, it is a good choice to rent a car to explore the surroundings. There are 3 restaurants serving a fine selection of Chinese dishes. 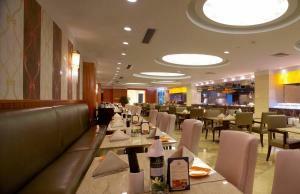 International flavours and coffee can be found at Mediterranean Western Restaurant and Sun Shine Café. Guests can spend a relaxing afternoon enjoying beverages at the lobby bar. 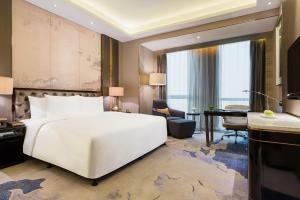 Located in central Zhuji, Yaojiang New Century Grand Hotel offers 5-star luxury with free internet access and flat-screen TVs in rooms. It features a fitness center, sauna and massages. 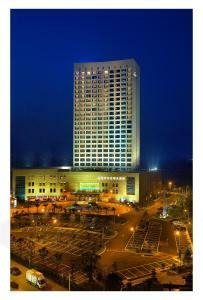 Yaojiang New Century Grand Hotel Zhuji is a 15-minute drive from Zhuji Train Station. Well-known attractions like Wuxie River and Zhuji Museum are 15 to 20 minutes from the hotel by car. Modern rooms feature carpeted floors and floor-to-ceiling windows. They are equipped with ironing facilities, a safe and cable TV. 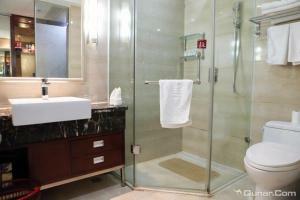 Guests will find a bathtub, hairdryer and bathrobe in the spacious bathroom. Guests can unwind using the jacuzzi and sauna, or with a karaoke session. 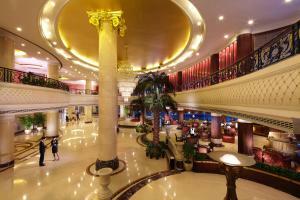 Yaojiang New Century Grand has a business center, a gift shop and tour desk. It also offers car rental and airport shuttle. Dining options at New Century Grand Zhuji include Pearl Restaurant, which offers Chinese fare, and a Japanese restaurant. 24-hour room service is available.